Ablation via a laser creates a plasma plume containing ions that can be loaded into an ion trap. The plasma plume is seen as the bright blue fluorescence. The quadrupole ion trap composed of 4 metal rods is housed in a vacuum chamber. Einstein showed time is not the constant thing we once thought it was. This revelation has given newfound importance to the precision of clocks. Even after almost 100 years, experiments still gain valuable information from ever more precise measurements of time. A new type of clock promises this. Current atomic clocks work via a probing laser resonating with a certain transition energy between two levels of an atom. The laser is kept at an extremely exact frequency by a feedback system which notices if the atom is not being excited by the laser. The frequency of the laser becomes the standard for a clock. Researchers from both the Centre for Quantum Dynamics and CSIRO are collaborating on constructing a radiofrequency (RF) trap for single Thorium ions – the most viable candidate for the development of nuclear atomic clocks. 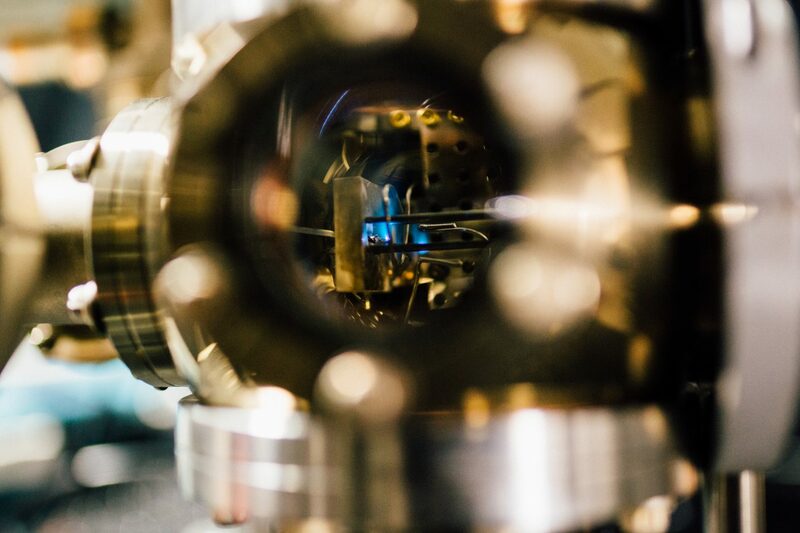 This will pave the way to the development of a new prototype atomic clock based on a nuclear transition in single Thorium ions. The nuclear clock is predicted to show unprecedented frequency accuracy and stability. A clock this precise will be useful in the application of time dilation. Einstein’s theory of general relativity predicts time runs slower by a miniscule amount in denser regions of the world which have slightly stronger gravity. This solves the problem of mapping areas underground that cannot be reached. This includes mapping changes in density due to the motion of the tectonic plates, magma flow, erosion, water concentration in aquifers, melting glaciers and metal, mineral, oil and gas deposits. The apparatus required to create a vacuum and trap ions. We have designed and constructed an experimental setup for investigating Thorium ions in the electromagnetic trap. We create plasma from metallic target by laser ablation. A high energy, focused pulse laser creates the plasma plumes containing Th1+, Th2+ and Th3+. We also tested our method of trap loading with Ytterbium ions for comparison. The ions are then injected into the RF-trap region, stored and when released, directed towards the detector. 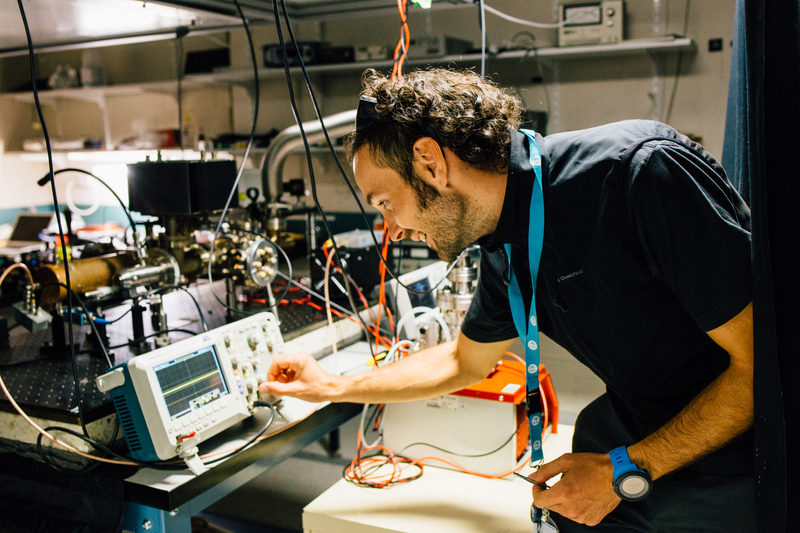 A mass spectrometer filters ions of interest and leads them into the a charged particle detector – a channeltron. Stability plots showing proof of Th1+ and Th2+ being mass filtered. These plots agree with the Mathieu equation. 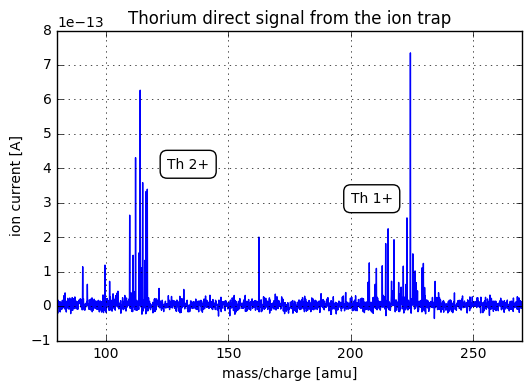 3 clear peaks have been observed experimentally corresponding to the three Thorium ions.